More businesses are depending that their computer systems are staying up and continuously running. To protect them, they have piles of tape backups made. However, these tapes are never ever touched or tested. Another choice for disaster recovery is to build a replicated remote data center. But this can get pricey. 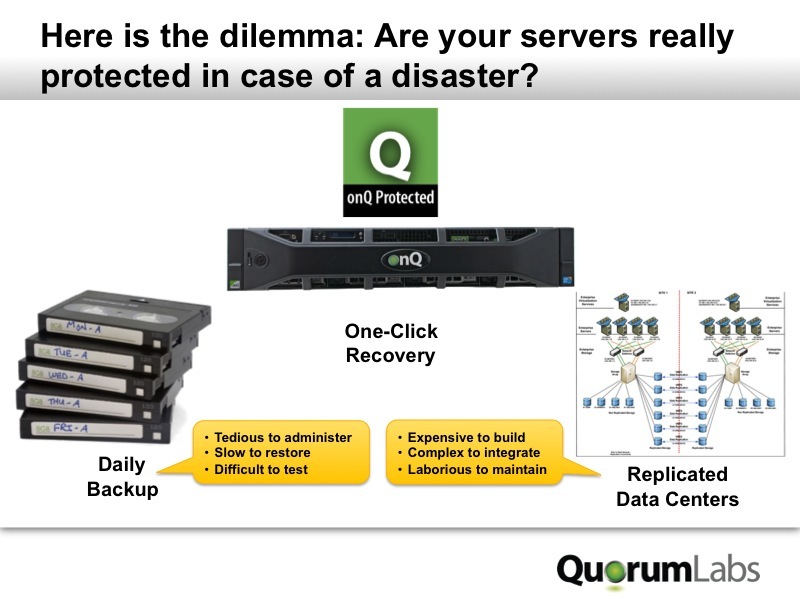 Enter QuorumLabs and their onQ Recovery appliance. I spent some time last week working with them and produced this video screencast that explains its features. For about $20 large, you can set up a pair of these appliances and fully protect all of your Windows servers. It uses some cool virtualization technology to make copies of your running servers, so when one goes south you don’t have to run around trying to recover it quickly. This entry was posted in Product reviews, virtualization by dstrom. Bookmark the permalink. We sell these appliances out of Sydney, Australia through our compnay The IT Consultancy Group. I thought your analysis was spot on and in a short summary picked up the space in the market that the onQ appliance filled. Great post.